There are many animals from the North Pole region but the are also penguins because we kept getting requests for them. 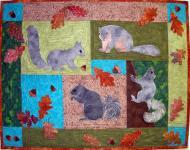 We know they don't live up North, but every quilt should have at least one mistake! If you want lots on penguins, we have them available separately as a pattern of their own. 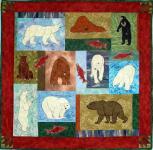 Thirty three animal drawing for machine applique including a yak, a polar bear, a caribou, white swan, an eagle, a bear, a walrus, a couple of seals, a mountain goat, a puffin and an Akita. The quilt in this photo is 40" x 52".